Buying new property in Germany, or one that is currently under construction, is different from buying an older property. How you pay the developer and your payment plan are totally different. 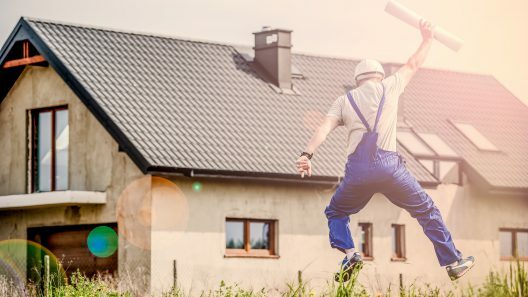 Here’s what’s you need to know when you buy a newly constructed property. When you buy a new apartment or home, you will more often than not buy directly from the developer. A developer is an entrepreneur who buys land and builds real estate on it. These are mostly small or medium-sized housing companies or large real estate companies. Even a bricklayer can become a developer. But banks, insurance companies or private individuals can also act as a developer. The developer will assign the actual construction work to a qualified construction company or team. However, the developer is responsible and liable for the entire construction, sale and finances of the project. In the early sales phase, the developer has not yet begun construction. The buyer usually will only see a blueprint or mock-up of the design from the architect. The buyer may be able to choose the location of the home or apartment or even the floor plan at this stage. Buying at the blueprint stage can carry certain risks. The buyer is, in some ways, buying blind. So, it’s important to thoroughly examine the blueprint, prospectus and all documents when buying new property in Germany. Floor plans at scale with a direction compass. Mapped layouts. Price list, including surface area description price, garage price, garden size, basement or attic areas, etc. If any of the information above is missing, do not hesitate to ask for clarification from the developer. Banks only completely finance a few small property developers. After construction, the lender will set a collection date. It is now common practice for the developer to sell 50% to buyers before beginning with construction. This hedges the risk if the developer does not reach the sales rate within the agreed time limit. In case this happens, the buyer’s contract must include a right of withdrawal. The developer must also clarify the cost question, including who pays the eventual reversal at the notary. Since buying from a developer brings some risk, the purchase contract and construction modalities are strictly regulated. Mainly, this is because the developer could become insolvent or bankrupt during construction. The lender transfers funds from the lender’s bank to the developer’s bank. Usually, the developer and broker receive these funds in the early construction phase. The lender usually releases funds in seven instalments. Typically, the contract with the developer allows you to make installment payments at different construction phases. Buyers and developers rarely agree to a full payment of the purchase price all at once. Installment payments once certain construction milestones pass is advantageous for both sides. The first installment depends on when the buyer purchased the property. Collaboration with a property developer can extend over several months, and possibly even more than a year. Often, the contract is signed before construction has even begun. But when the buyer purchases after construction has already begun, both parties usually agree to installment payments. This way, the developer does not have to wait until all work is done to begin receiving payment. And for the buyer, they do not bear the risk of paying for work that has not yet been done. 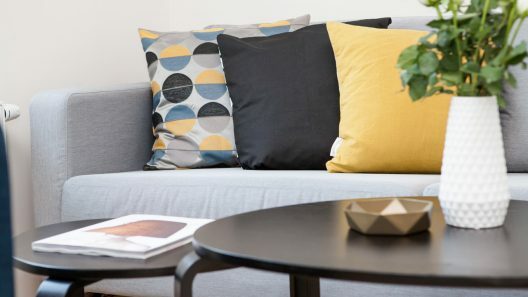 The amount of the first installment will depend on whether the buyer purchased the property in the classic way, a direct purchase, or through a leasehold. If the transaction is leasehold, the developer may charge 20% of the total purchase price as soon as they break ground on the construction site. On the other hand, if the property will become the full property of the buyer, then the developer requires 30% of the total purchase price as soon as they break ground. The buyer will make remaining payments as construction progresses. As the developer passes certain construction milestones, the developer can ask for step-by-step installments. The percentages in the table below show the percentage of the balance usually due at each construction step. 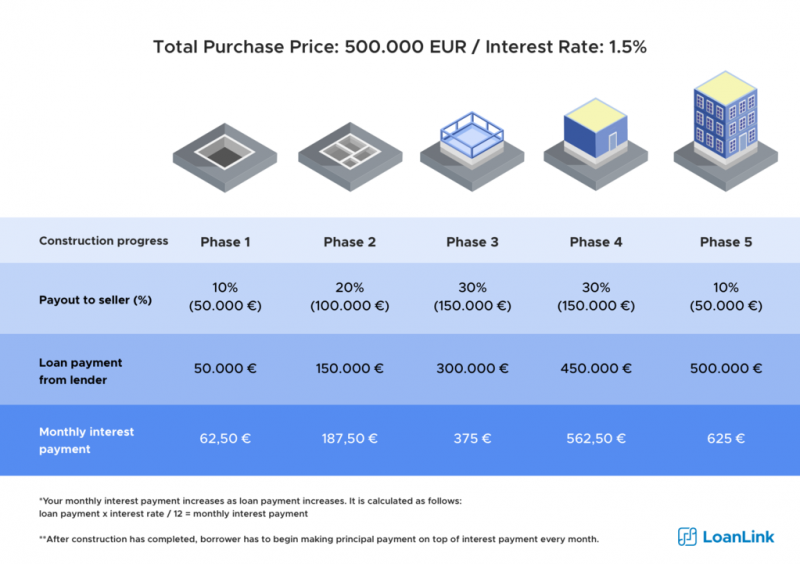 In accordance with these specifications, the developer creates a payment plan that includes a maximum of seven individual payment installments. If successive milestones are combined, the sum is due after the last milestone is completed. During the construction of the purchased property, buyer is only responsible for making monthly interest payment while the lender takes care of the pay out. It is only until after the completion of construction where the borrower needs to make monthly principal payment on top of interest payment. Naturally, many buyers like the idea of customising a property from the beginning. 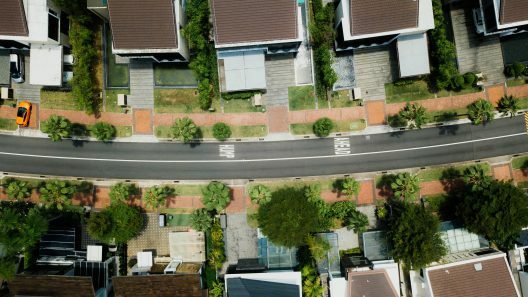 There are many advantages to buying a new property or a property under construction, but buyers should prepare for risks. The more you know and prepare, the more you can set yourself up for success. Building your home or buying new property in Germany is a milestone, and a little research will give you a peace of mind along the journey.